Can you buy perfect coffee maker under $100? No you can not, but you can buy very good coffee maker for that price. If you are not coffee nerd probably you will be satisfied. If you are picky then you must be willing to give more than one hundred dollars to owned superb coffee machine. Owning a good coffee maker is a necessity for every home and especially if you are a heavy coffee drinker. Having a coffee maker comes with an invaluable number of benefits. It saves you time and money spent on coffee shops. Most importantly, you can enjoy a mouthwatering hot coffee any time of the day without leaving your house. A good deal coffee maker costs a fortune. Such a coffee maker gives you the opportunity to customize your coffee the way you want. However, if you are tight on budget, it shouldn’t limit you from owning a coffee maker. When all you require is to enjoy a good cup of strong coffee without the added frothed milk and the likes, you are covered. With these best under $100 coffee maker, you have an opportunity to brew your own tasty coffee. All the same, while making a purchase, some desirable features should guide you. For instance, a real coffee maker should be versatile, fast in brewing, have a large water tank, and most importantly cater for your coffee cravings. Now without further ado, let’s look at some of the most affordable coffee makers that you should consider. Note – If you want your coffee is always fresh and delicious recommended for you is to grind coffee beans. Check top burr coffee grinder if you want to drink tastier coffee. 100 dollars is not enough to afford a perfect coffee maker for you if you are coffee snob but there are many inferior coffee machines for the same money. We give you our opinion what are the best coffeemakers for that budget. First we check multi cup coffeemakers than best single serve coffeemakers. One look at this coffee maker might lie to you that it is just another simple and traditional coffee maker. A closer look, however, will prove you wrong. It has enhanced and desirable features that will improve your coffee brewing experience. The DCC-3200 features focus on improving your coffee quality. For instance, it features two water filters; charcoal and gold leaf water filter. Both filters work on improving the water quality, and hence ensuring your coffee doesn’t lose its flavor. To ensure that your coffee meets your preferences, this coffee maker employs state of the art heating technology. With this feature, you can customize the heat of each pot of coffee as you wish without either burning the coffee or making it lose flavor. It has a 14-cup glass carafe for large brewing experience. Features a programmable heating technology to produce maximum flavor and freshness. It has two filters, charcoal, and gold leaf, both of which help maintain the flavor of each pot of coffee brewed. It features a customizable zero to four hours shutoff. It has a self-cleaning feature that helps keep your coffee fresh for long. The large carafe comes in handy if you want to retain a pot of coffee throughout the day or you are brewing coffee for a large group. It provides consistency with every cup of coffee brewed. You can easily customize 1-4 cups of coffee. It has a plastic component that tends to burn over time. BUNN NHS Velocity is for any heavy coffee drinker or someone who has a large family. This coffee maker can brew a large amount of coffee at once and without wasting time. It is highly versatile and can meet the desires of both coffee and tea lovers in a family. It is important to note that BUNN NHS Velocity doesn’t have the looks. You might dismiss this coffee maker if you were looking for something attractive for your kitchen. In fact, if coffee makers were to be categorized by physical attraction, this machine would scoop a position at the bottom. Its functionality, however, makes it qualify as one of the best coffee makers under $100. 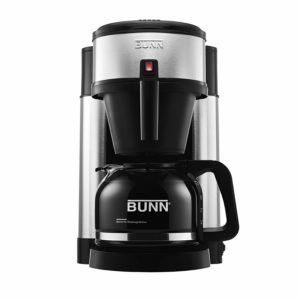 Owning the BUNN NHS Velocity coffee maker gives you an opportunity to use either tea pods, tea bags, coffee pods, and even loose tea to make your favorite beverage. More so, this product is made by a well-established company that is known for producing quality products. It has a detachable brewing head that slides in and out of the machine easily. It features two drawers, one for keeping your tea bags and coffee pods and another for storing ground coffee. It has two buttons only, Brew and Pulse. The pulse button allows you to brew slowly and hence improve on the flavor of your beverage. The internal hot water tank is made of stainless steel and holds water at 200 degrees Fahrenheit such that it’s always ready to brew. It is easy to use considering it doesn’t have many confusing buttons. It has the capability of brewing anything thrown at it including, coffee pods, tea bags, and loose tea. It is designed to use K-Cups, coffee pods and tea pods which are quite popular these days. It is fast considering it takes on 3-4 minutes to brew a cup of hot and fresh coffee. The unique spray head allows optimal flavor extraction. It can produce 4-10 cups of coffee at a go. If you are looking for a durable and sturdy coffee maker under $100, then Zojirushi EC-DAC50 Zutto is a perfect choice. This coffee maker is made of both plastic, glass, and metal, all of which combine to produce durability. To enhance its looks, the machine is given a silver finishing which makes it sleeker. 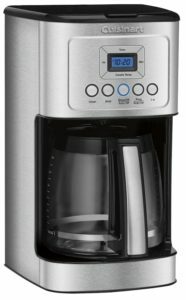 Note – Check our list Best 5 cup coffee maker Zojirushi EC-DAC50 is in our opinion best 5 cup coffee maker. And that is not just our opinion, on Amazon this coffee maker have score 4,3. It uses a removable plastic filter which makes cleaning easy. 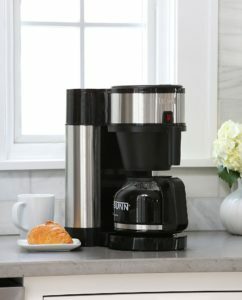 It’s genius engineering, and sleek design makes it one of the high-end coffee makers available at an affordable price. 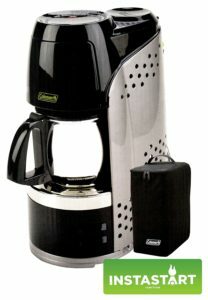 It is an 850 watts machine and features a glass carafe with a plastic handle and holds up to 5 cups of coffee. Additionally, this coffee maker has a detachable water tank for easy refilling and cleaning. Other notable features include a water filter and plate warmer. It features an 850-watt boiler which helps in maintaining consistent temperatures of 200 degrees Fahrenheit. 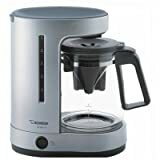 The carafe lid for this coffee maker is also the machine’s filter basket and hence solves the leaking solution in all other similar coffee makers. It has a permanent charcoal filter and a removable water tank. The upper and the lower ends of the Zojirushi coffee maker are flat with the other parts being subtle curves and delicate bevels. It’s mind blowing design will make it look great on your kitchen counter. The charcoal water filter purifies water to produce delicious coffee. It has an optimal temperature retention. It features a brewing plating. 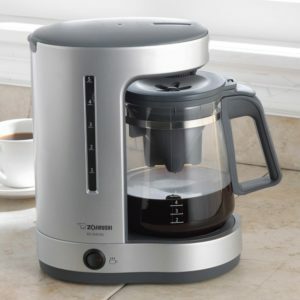 Considering its brewing capabilities and sleek design, this coffee maker is incredible for its price. Carafe handle design is not the best. 5 cups of coffee per batch is too small. If you love K-cups than you must own Keurig or some other K-cup compatible coffee maker. 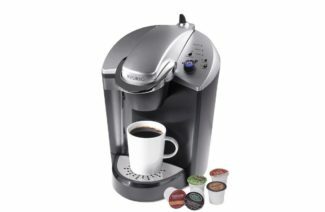 When we talk about the budget a hundred dollars then this is definitely 5 best Keurig coffee makers under 100. 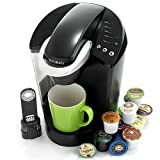 You will not make a mistake if you buy any of the above Keurig Coffee Makers because all are great and between this coffee makers are not to much difference. For all those who want to know more about the differences between K50 and K55 or K45 and K55 difference and all other relevant information related to any one Keurig coffee machine you can find on our site. Despite being a single cup brewer, it provides a sturdiness that you would expect from a commercial coffee maker. It is stylish with a black and silver design, which brings out a traditional yet sleek design. Keurig K145 OfficePRO is highly versatile and can brew coffee, chocolate, and tea. With this machine in your office, all members can enjoy their desired cup of beverage in a minute and with a touch of a button only. Additionally, it features an auto-off capability that enables it to shut down after two hours of inactivity hence saving power. This coffee maker can accommodate up to three different sizes of coffee mugs. As a bonus, the drip tray is removable allowing accommodation of a travel mug. It also incorporates a 12 count K-Cup variety box. It has a detachable water reservoir with a capacity of 48 oz. It measure 13.3 x 9.5 x12.3 inches and weighs 14lbs. It has a “Drain Brewer” button which helps you drain all the water from the tank. It has an internal pump which produces more power hence reducing time. With a removable water tank, you can easily refill it and clean separately. The water reservoir fits perfectly well with the brewer hence leaving no space for contamination. The drip tray is removable making it easy to clean. It offers versatility when it comes to flavors as it supports the traditional K-cups. It has an inbuilt water tank that helps save time. It can handle brewing several cups a day without changing flavor or brewing speed. It produces a noise immediately after switching on which lasts for a few seconds. Considering it is designed for office use, the noise is a significant loss. If you want to treat yourself with excellent camping coffee maker you must check Coleman Instastart. If however you want to be within the budget then this coffee machine is not for you. If you love backpacking, tailgating or camping and wouldn’t live without your cup of coffee, then this is your go to coffeemaker. It is highly portable and efficient on fuel conservation. It can brew up to 40 pots of coffee using a small propane cylinder. Coleman is known for manufacturing products that favor backpackers and campers. They didn’t go wrong with this coffee maker as they made it light weight. It weighs 0.85 pounds and measures 5.8 x 7.2 x7.7 inches. It features a flip up lid which prevents spillage when serving coffee. Additionally, it is dishwasher safe making it is easy to maintain sparkling. This Coleman Quickpot Portable coffee maker is easy to set up and lights up smoothly. With its small portable size and no need for electricity, it is the perfect solution to your coffee desires when you are out in the wild. Pause and serve feature that allows you pour a fresh cup of coffee when brewing. It uses perfect flow technology for consistency flow even in extreme conditions. It has instant ignition which is suitable for with matchless lighting. Suitable for camping considering its size and weight. Cheap considering propane is inexpensive. With the market flooded with affordable coffee maker models under $100, there is no need of stressing yourself with the more sophisticated machines. As a novice in brewing, you can settle for a cheap one that won’t hurt your wallet in the meantime you get ready for upgrading. You, however, need to make sure that the coffee maker you pick meets certain features. Give much attention to the water reservoir size, the design, housing material, bar pressure, and the size. Once you comprehend what you want, you can never go wrong with choosing the right fit. 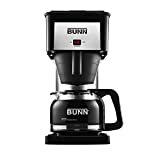 Note – If you have budget $50 you can check Best coffee maker under $50. There you have some very cheap coffeemakers that maybe good enough for you. We hope that our reviews help you to decide which coffee maker to buy. Good and affordable coffee maker can save a lot of time and money, and also improve your barista experience. By the time you are in a position to purchase a more sophisticated coffee maker, you brewing experience will have developed. About Update – We did not update our list for a long time. Prices have changed and we add note where the prices now is above 100 dollars. Previous story Coffee and pregnancy: Is it worth the risk? Thanks for the honest reviews! I got the Zojirushi Zutto Coffee Maker after going through the reviews here, all features are same as seen here. It’s a good product. Thanks.